Peter Pomerantsev’s Nothing Is True and Everything is Possible presents a Russia with no rules and no certainty in tomorrow, a place where you must live in the moment, because the moment is all you have. Have you ever wondered why they give Oscars to film editors? Editing is extremely important – only when you sit down to edit can you understand whether or not you can make a film out of whatever it is you’ve shot, no matter how many great takes you’ve had. Peter Pomerantsev’s Nothing Is True and Everything is Possible is a testament to the power of editing; and his documentary film background is evident in the seamless transitions between the stories of characters that populate it, as well as the storytelling itself, at once rich and economical. Pomerantsev has used the years he has worked on Russian television to tell a collection of tales that, like tributaries, feed into a greater narrative of Russia’s oil-soaked heyday, before an unpredictable new course was charted with the annexation of Crimea. The parable of a Westerner encountering Russia’s darkly irresistible folk magic, and finding out that it is not entirely what it seems, is an old one; and it is a testament to the power of Pomerantsev’s writing that he dominates the trope rather than it being the other way around. Pomerantsev is a wonderful observer of moments as odd and beautiful as they are discordant: the ‘bare, perma-tanned backs moist with snow’ he sees on gold-diggers trying to get into a nightclub popular with the ultra-rich; the spectacle of commuters who ‘come every day to [Moscow] to be within distance of all the platinum watches and Porsches, only to be blown back again each evening to their dark peripheries;’ Russian bureaucracy’s ‘wide, dusty, empty corridors, where everything happens as if under water.’ The windows on Russia are selective, calibrated for their greatest appeal to a reader craving tales from an ‘exotic’ country, but at no point does one feel that Pomerantsev is sliding into caricature. Those of us who have kept much shabbier company in Moscow – without attending lavish parties or working on stories about tragic fashion models – will still recognise Pomerantsev’s Russia, a place with no rules and no certainty in tomorrow, a place where you must live in the moment, because the moment is all you have. Those of us who have kept much shabbier company in Moscow will still recognise Pomerantsev’s Russia. The most chilling example of the unpredictable nature of life in Russia is the story of businesswoman Yana Yakovleva, swept up in a security agency’s battle against the chemical industry, snatched out of her comfortable life and forced into the hell of Russia’s notorious pre-trial detention system. Anyone who has done any reporting from Moscow’s criminal courts, where glacially calm judges usually cooperate with the prosecution, and the conviction rate is over 99%, knows exactly just what kind of claustrophobic nightmare Yakovleva found herself in. Daily life in places like Moscow is built on illusions. Most of the events taking place in the book occur before Russia’s bitter fall-out with the West over Ukraine, but anyone looking for clues as to why the Kremlin risked the possibility of economic meltdown by annexing Crimea and engaging in nonlinear warfare in Ukraine’s east will find plenty of them in the book. Pomeranstev’s recent work has focused heavily on how Russia reinvented reality as part of an informational blitzkrieg. In Nothing Is True and Everything is Possible, we see how so-called Russian ‘unreality’ was first successfully used on a domestic audience – as Russia was turned ‘from a representative democracy to a society of pure spectacle,’ a process that began with the late Boris Berezovsky’s manipulation of the media – and before it began to export its new propaganda abroad. It can be argued that every nation is entitled to its very own brand of ‘unreality’ – certainly the manipulation of the US media in the run-up to the war in Iraq, was a process closely observed by Russian strategists. The trouble with Russia is that it is much more brittle and chaotic than the West. Militaristic rhetoric has been used as a kind of compensating tool for political figures who know that Russia’s position is fragile – that not even a huge nuclear arsenal can make up for shoddy infrastructure and catastrophic social inequality, among many other real threats to Russia’s stability. The trouble with Russia is that it is much more brittle and chaotic than the West. But ultimately, lack of real news, independent social institutions, and any checks on power at all – all of those absences that combined to create the domestic ‘unreality’ so vividly described in Pomerantsev’s book – have insulated the Russian government from any outside context. When singer Mariah Carey had a breakdown on MTV back in 2001 – when there was no social media, and erratic behavior by famous people still often came as a shock – Britney Spears, herself soon headed in the direction of public personal crisis, rather poignantly told a journalist that, ‘A lot of stars believe their own hype and actually think they’re some sort of goddess.’ Except, of course, they’re not – and when they realise it, they struggle to cope. Over the last few months, I’ve come to view the Ukraine crisis as the Kremlin’s very own ‘Mariah moment,’ when belief in its own hype – hype orchestrated by propaganda mechanisms brilliantly observed by Pomerantsev – eclipsed common sense. Russia has tried to recapture its greatness by snapping back at the West, but, looking ahead, with the oil price falling and sanctions beginning to take their toll, one has to wonder just how ‘great’ of a shape this country will be in. Feelings of helpless regret are common in those of us who have watched the Russian government veer dramatically off-course, and Pomerantsev’s recollections of the years that lead up to this are also delicately threaded with sadness. While writers like Pomerantsev are routinely accused of ‘hating’ Russia, anyone with cursory reading skills will see in Pomerantsev’s narrative a plaintive kind of love. It is the love that male protagonists of the romantic tradition have for beautiful, broken women – but without the usual, tedious pathos. And thanks to the precise choreography of Pomerantsev’s writing, the message of the book is ultimately more powerful and piercing than any patriotic chest-beating; it is the idea that Russia’s addiction to oil, and a severe, top-down power structure, has lead the country to cannibalise its own potential and human capital. Russia’s addiction to oil, and a top-down power structure, has lead the country to cannibalise its own potential and human capital. Being brought low in Russia is not just for oligarchs, it has little to do with social justice in the face of illegal enrichment, though crackdowns on the wealthy are routinely spun this way. Instead, it is for everyone who rises ‘above their station;’ and sometimes it is also for people who merely get in the way of someone more powerful. This is why Pomerantsev’s Russia is populated by gifted people who know that flying too high will likely result in them being brought down in a cruel and humiliating fashion. Perversely, it is the atmosphere of limited repressions – ‘1937-lite,’ as some observers like to joke – that has remained one of the few tools with which the government can unite Russian society today. From witch-hunts executed by pet media outlets to high-profile arrests, the Kremlin ensures that the majority falls in line, banding together against whatever flavour of the month is currently the enemy; and undermining grassroots initiatives, which might eventually build a civil society. With a few notable exceptions, the Western press is rarely interested in untangling the complicated threads of Russia’s bloody history in order to try and understand why the country is still run this way. This is why I would have liked a writer as sharp and wickedly atmospheric as Pomerantsev, to provide more historical context – if only because without it, the startling picture of Russia that he paints, seems, in the end, somewhat incomplete, as if not coloured in all the way. Pomerantsev’s undoubted strength is in his power to reflect human stories – he does this more precisely and compellingly than virtually any camera lens could – and when he maximises it to his full potential his narrative lifts out of the sociopolitical, and heads for the sublime. This is a writer who will seize your heart when you least expect him to, and you love him all the more for it. 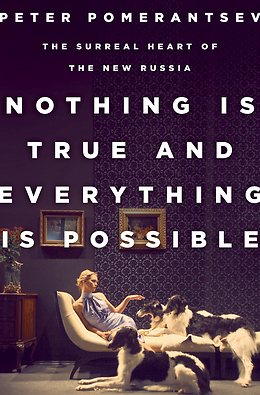 Peter Pomerantsev's 'Nothing is true and everything is possible' is published by PublicAffairs on November 11.